Rambo III was called the most violent movie ever made by the Guinness Book of World Records, as the Vietnam veteran claimed over one hundred dead by explosive-tip arrow or otherwise in that movie. 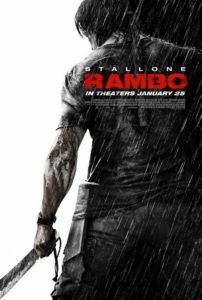 Rambo’s latest excursion at the very least approaches that record; what it doesn’t accomplish in sheer volume, it claims in blood and gore. 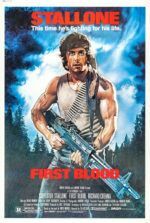 Indeed, Rambo is one of the bloodiest movies in recent memory, approaching horror movie extremes with its buckets of blood and uncountable bullets. And while one could chalk up the violence to Stallone’s intended depiction of genocidal atrocities, too much of it feels like glorification—blood for blood’s sake, rather than political commentary. This time around, John Rambo is back in Thailand, hiding from the world and from himself. A group of medical relief missionaries ask Rambo to take them by boat into Burma, to help those suffering from the sixteen-year civil war there. He’s convinced by the group’s resident Samaritan Sarah (Julie Benz) and her uptight partner Michael (Paul Schulze); some time after dropping them off, he discovers they never reported back. 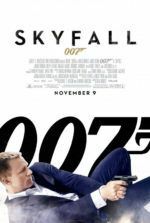 Burmese kill-mongers kidnapped the missionaries, and so Rambo is asked to take a small group of hired guns into Burma and rescue them. Rambo and the rescue-mercenaries kill everyone in sight; so many are killed, in fact, that we become lost in all the killing. Sarah and Michael talk endlessly about how violence is not the way, that there is a peaceful solution no matter the political strife. Stallone is careful to feature many children and women being shot up or stabbed or blown apart, just so we see the terror currently common in the Burmese Civil War, thus justifying Rambo’s response. But we learn nothing of the motivation of our antagonists and why they remain violent, therefore almost nothing is done to help us understand what is at stake, aside from the preservation of (some, if only a little) human life. We can’t help but cringe and look away during early scenes, wherein violence is depicted as tragic and awful. 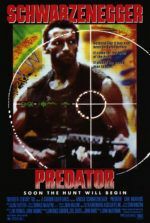 But later, when Rambo-enforced justice is bestowed on the missionaries’ captors, violence is cheer-worthy and grotesque. Computer-generated blood and guts are prominently displayed via exploding heads, chopped-off limbs, and complete dismemberments. Deaths are accomplished by way of machine gun, arrow, at least one mushroom-cloud explosion, and yes, even a rock. But what does any of this have to do with Burma? Why did Stallone choose this location if his audience learns nothing significant about it, other than Burmese soil soaks up blood just like the soil anywhere else in the world? Despite being shot well, acted with reasonable talent, and thankfully lacking in this series’ traditionally cheesy dialogue, Rambo is devoid of any redemptive character developments that were so appealing about Rocky Balboa. I’m not sure what the movie tries to say (if anything), other than Sylvester Stallone is still capable of blasting away bad guys and outrunning massive explosions, even at 60-years-old. He looks more hulking now in his old age, with a stronger body and wiser disposition, recalling a Hellenistic Greek sculpture of an aged, thick God, worn-down but filled-out. Stallone moves with believable intensity, entertaining us mildly in his confused juxtaposition of anti-war sentiment and glorification of violence. If this is a pleasure, it remains the guiltiest kind.